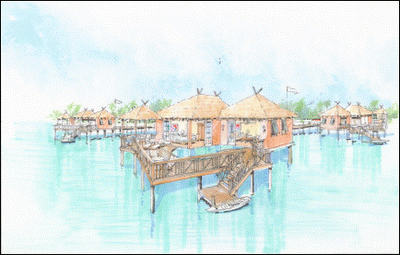 Sandals To Introduce "Over The Water Bungalows"! Start saving up now! Sandals is working on a 220-room expansion to the Sandals Grande St. Lucian property. The Greek Village will be the newest addition and is scheduled to open in 2013 in the Gros Islet area of St. Lucia. The Greek Village at Sandals Grande St. Lucian Spa and Beach Resort include Swim-Up River Suites; Rondoval Suites; and 26 Over-the-Water Bungalows, both a first for the resort chain and the first of their kind in the Caribbean. Each 1,300-square-foot, over the water unit will have the same amenities and décor as all suites at Sandals Resorts, but is perched on a deck leading down to the sea. Rumor has it that the suites will also include a plunge pool, jacuzzi, and see-through floors matching world-famous over water bungalows in Tahiti. In fact, I was specifically told "Think the Millionaire Suites, but over the water" by my Sandals Business Development Manager when we met just a week ago. I can't imagine how amazing these will be! And Sandals couldn't have picked a better resort to add them to. With water on both sides, this resort paradise is perfect for couples! Add over the water bungalows to the mix and you get a vacation unlike any other in the Caribbean! As many have seen from our previous posts, our company has been on top of the status of the proposed Overwater Bungalow at Sandals Grande St Lucian since the idea of these suites were first announced. We've been working with our contacts at Sandals Resorts International for the past two years now to get updates to you on what has been happening since the ideas inception. During 2012, we had hoped to see the bungalows ready for Sandals' originally intended 2013 release, however some issues with the St. Lucian government cause a bit of a hold up. The St. Lucian government finally signed off on the bungalows and we were told about it first thing by CEO Adam Stewart, at the 2012 STAR (Sandals Travel Agency Recognition) Awards down in Nassau this past December. As many know, Sandals shifted it's focus to opening their brand new resort in Grenada, Sandals La Source. They also made multi-million dollar renovations to several of their properties and have added the Key West Village to Beaches Turks and Caicos this past May 2013. With all of this and the issues with the government, it's easy to understand how the bungalows had taken a back seat for a little while. However, we are excited to have learned that Sandals is moving forward in early 2014 with the 80 million dollar renovation on the Grande St Lucian that will include a new village with 185 rooms, four new restaurants, and the addition of these 15 overwater bungalows! It looks like Sandals will be back on track with the bungalows and while there is no official word on when they will open or if it will hit any snags again, but we're hoping to see them finished by 2015! Either way, Sandals still offers some of the most gorgeous suites in the Caribbean, and anyone honeymooning at or planning a visit to Sandals before the bungalows are ready will find a plethora of alternative options. As always, we're happy to offer our free help with anything you may need regarding your Sandals vacation. Feel free to email us at SandalsSpecialist@myparadiseplanner.com or call us at 1-888-373-3677 x 1 for Sandals Resorts inquiries. 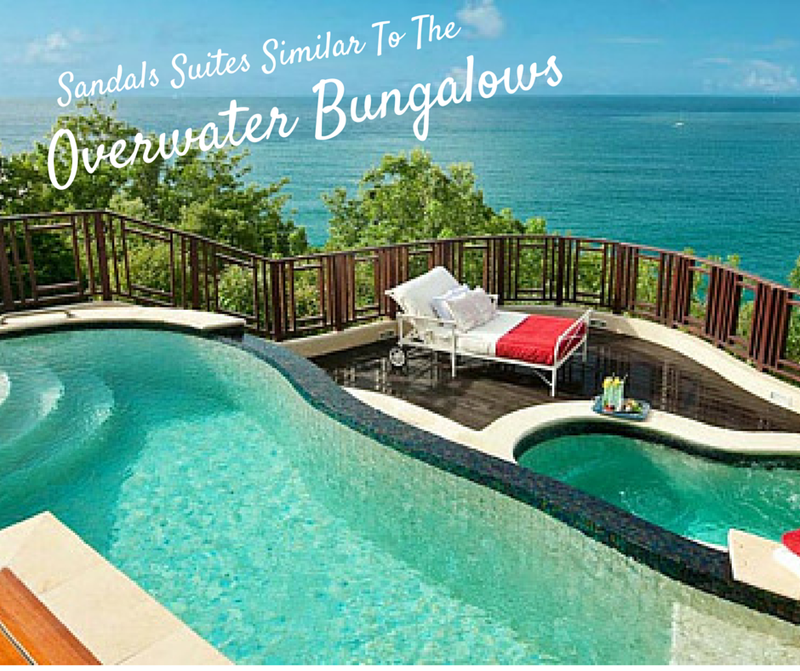 **Click Here for info on the Sandals Overwater Bungalows coming soon to Jamaica! Was this information helpful? If so, please consider booking your next Sandals or Beaches vacation with me. My services are all-inclusive too, as they are 100% free for you to use. The price will be the same you'd get by booking anywhere else-- the difference is you'll be getting my valuable expertise before, during and after your trip! Click here to email me for help.